Rare Find. Porsche 911 Carrera Supersport Targa. One of the rarest of all this generation of 911. 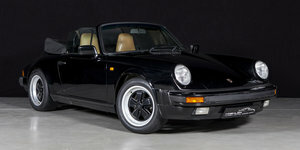 41,600 miles Research shows Porsche manufactured 63 M491 'wide-body' Targa for the UK in 1989. Coupe and Convertible both were built in greater numbers. This is one of the very last of right drive UK cars. C16 (UK specification). Matching numbers. Factory M220 option 40% Limited slip differential. Registered on 1st August 1989, the first day for 'G' registration cars and supplied by Charles Follett (OPC London) to Mr Angus Didsbury of Essex. Complete with original book pack, service book and driver's manual, tool roll and original spare wheel. The low mileage is supported by service history with records in the service book; * 3,199 miles - Dingle Garages Ltd (now official Mercedes Benz centre), North Wales * 12,878 miles - Jct 600, OPC Bradford * 16,248 miles - Merlin, OPC Nottingham * 17,656 miles - Sytner of Nottingham * 31,926 miles - OPC Lancaster Colchester * 32,777 miles - Merlin, OPC Nottingham * 36,713 miles - Statller, IPS Sheffield * 38,348 miles - OPC Sheffield * 41,160 miles and 41,293 miles Specialist Cars, IPS Yorkshire MOT certificates; * 2004 at 33,271 miles * 2006 at 33,700 miles * 2007 at 34,700 miles * 2010 at 35,262 mile * 2011 at 35,334 miles * 2012 at 37,185 miles * 2013 at 38,348 miles * 2014 at 39,367 miles * 2015 at 40,354 miles * 2016 at 40,949 miles * 2017 x 2 (when it was last sold by Specialist Cars of Malton) at 41,160 miles and 41,293 miles Guards red (L80K) with Linen leather and carpets, black dashboard and trim. The specification codes are: 058 Impact absorbers front and rear 220 Locking differential 40 % 243 Shorter shift lever for G50 transmission 330 Cassette-radio Blaupunkt Blaupunkt Toronto SQR 46 335 Rear automatic 3-point seat belts 383 Sports seat, left, electrical height adjustment 387 Sports seat, right, electrical height adjustment 425 Rear window wiper 490 Sound system 491 Turbo-look 494 Amplifier 567 Top-tinted windscreen 975 Luggage compartment velour carpet Additionally it has a modern Porsche Classic Radio-Navigation system with Bluetooth. Available now with just 41,600 miles, we can export Worldwide. For more information, photographs and video, please visit our main website. Inspection: All our cars are sold following a full inspection by our technicians. Reserve: Don’t lose the car you want; if you are miles away and can’t get to us immediately, we will provide detailed, accurate and honest information supported by photographs and video. We can reserve a car against a small deposit. We guarantee that if the Porsche is not as described when you come to view or when we deliver, we will give you your deposit back. 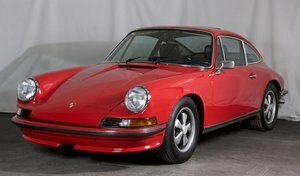 Warranty: We offer our very own warranty on our modern and classic Porsche for your peace of mind. Financing: We can arrange finance (subject to status) through one of our associated lenders (including specialist 10 year classic car loans). Delivery: We can deliver to your doorstep in the UK or arrange export anywhere in the world. Part exchange: Any make of vehicle considered. Porsche Finder Service: If we don’t have the Porsche you want in stock, call or email. We offer a very successful Finder Service. Let us do the hard work for you….it’s our job. Please call 01752 840307 and ask for Adrian or Dale. Williams Crawford Passion for Porsche, established 1991. 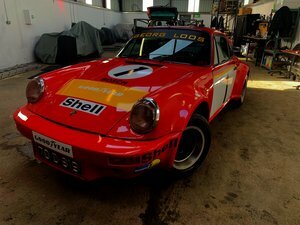 We deal with all aspects of Porsche; buy, sell, broker, service, restore, custom build, race and event preparation.